For several years now, my occupation has been to basically read everything written about new equipment. In order to help everyone save time, and to save the Internet millions of electrons, I have developed a concise method to summarize all such discussions for all newly introduced imaging equipment. I modestly call this Roger’s Law of New Product Introduction and have summarized it in the graph below. You will notice there are two possible paths a new product may follow. To date, these two paths accurately describe every introduced product. The laws of Quantum Commentary demonstrate that is possible that a product follows both paths simultaneously – for example a new Canon camera may follow path A on a Canon board, while following path B on a Nikon board. I suggest we refer to this as The Fanboy Uncertainty Principle. In theory, there is at least a third possible path, where a new product is perceived logically from the moment of its introduction. However, that path can be demonstrated mathematically to exist only in higher order dimensions and therefore remains invisible in the three-dimensional world of photography forums. It is possible that other paths exist, but I leave descriptions of these to persons more versed in theoretical mathematics than I. We do, of course, welcome such theoretical contributions in the comments section. While the implications of this work remain largely theoretical, it does have some practical purpose. Now you can simply copy this graph, mark it with an arrow and the statement You are here, and post it instead of having to write paragraphs of verbiage. Best summary of the internet eva! Also, on the top blue line just before the decrease a camera is awarded “Product of the Year” by websites no one in their right mind visits. This graph is also useful http://i.imgur.com/b2feF.png Where are you? The uncertainty applies to the external observer. For the observer it is unpredictable where the fanboy will start the journey. let me know if you want to get into a discussion about Texture Blending. You have my email, right. I believe the law is universal covering everything man made including politics. Don’t limit it to imaging equipment. Roger, I want to buy you beers for this work of genius. “Fanboy Uncertainty Principle” – good thing I had swallowed my coffee before I got to that. Ahh, without emotion, how could we ever profit from playing the market? As a math teacher, I approve of this graph. I look forward to watching other’s utilize it on forums from now on in those rare times I go into a gear hype/bash thread. Also, shouldn’t the left axis label read “overpriced best thing ever” for Leica ? I had a D800 which was close to the “Best thing ever”. Unfortunately, the left AF sensor was slightly backfocusing. I’ve sent pictures to Nikon USA who told me to send the camera for repair. – Advise me to turn on “distortion control” to find out if the focuses improve !?! – Can’t make a difference in between camera movement and front focus, even if some sharp grass is available in front of the focusing target. 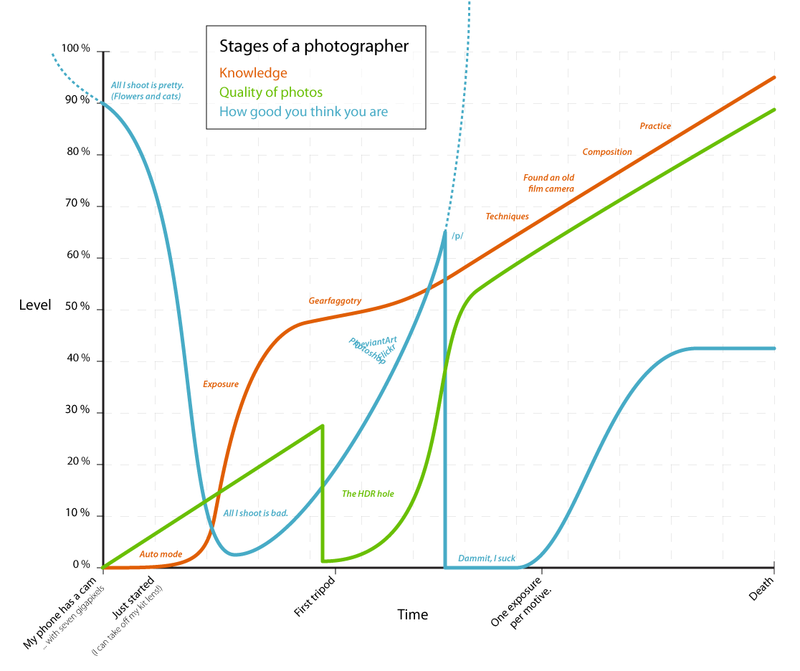 So, I’ll be happy if Roger adds a graph with the quality of Nikon USA service center. I am sure it will be plain flat. Heaven, I’ve got a feeling that this will be one of the most used graphics on forums during fanboy fests for the next few years! Enjoyed it. I shall copy and paste your graph whenever I’m confronted by the FanBoys. Perhaps the best description of these events is Richard Feynman’s sum of all possible paths approach to Quantum Mechanics, in which everything occurs but ultimately cancel out all of the events except those that are predictable and normal. Fanboys certainly do seem to have quantum uncertainty, bounce all over the place, and tend to cancel each other out. Nice graph. Inspired by the “hype cycle” maybe? Thank you Uwe! I’ve really enjoyed your texture blending videos – I’m going to have to get into that. For RED forums, there are 2 parallel lines, one Canon and one RED. God I hope the title sticks. If can’t Google ‘Roger’s Law of New Product Introduction’ or ‘The Fanboy Uncertainty Principle’ and find this being quoted in forums wars, I’m going to be very disappointed. Most amusing. I have seen the third path, but it’s rarer than honest politicians are. This graph is the BEST THING EVER, period, full stop. Absolutely love it! Perfect use of Mathematics, one of my favorite all time subjects.